"150,000 copies inexplicably sold in hardback. Hogwash is the most famous school in the wizarding world and Barry Trotter is its most famous pupil. It's been that way ever since J.G. Rollings' Barry Trotter and the Philosopher's Scone broke publishing records worldwide. So important has Barry become to the school's bottom-line that it has been agreed that he can stay at Hogwash for as long as he likes. 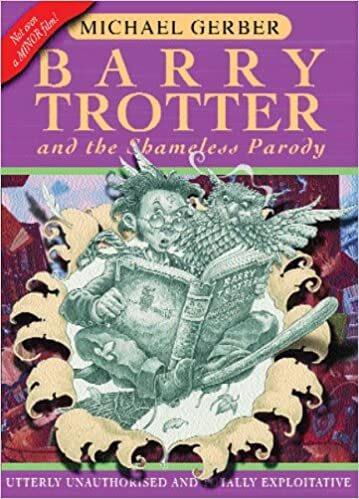 Barry Trotter is 22. Groupie-laden and scholarship-free, life has been good for the perpetual student, but now disaster looms. The movie Barry Trotter and the Inevitable Attempt to Cash-in has gone into production and the Marketing Dept. at Wagner Bros. is going into overdrive. Hogwash will be submerged under a tide of souvenir-crazed Muddle fans, torn apart and sold on eBuy, stone by mossy stone. The movie must be stoppped. Forget Lord Valumart - Barry, Ermine Cringer and Lon Measly must try to defeat the most powerful force of grasping sleazoids the world has ever known: Hollywood.